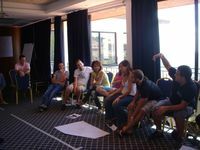 Jumpstart Youth Peace Campaign in Cyprus is an EU-funded project approved as part of the EU’s initiative to strengthen Cypriot Civil Society. The project has been implemented from February 2009 to February 2011. The project aimed to promote dialogue and cooperation among Turkish-Cypriot and Greek-Cypriot, and in the long run contribute to the reconciliation process in Cyprus. Main applicant has been the Turkish –Cypriot organization Youth Center Union, which jointly implemented the project with Future Worlds Center. The Overall Coordinator for the project was Huseyin Kursat. Three small-scale bi-communal projects have been implemented by the participating youth expected to help participants explore issues relating to Human Rights,Intercultural Learning, and Active Citizenship. These small scale-projects included: a) a panel discussion titled " Project stories" in which active youth leaders from Turkish-Cypriot and Greek Cypriot communities shared their experience and vision with the public regarding projects they have implemented, b) an interactive art workshop in which participants from different communities of the island communicated their perceptions on multiculturalism by means of painting on a big canvas, c) a visit to the archaeological site of Curium in Limassol during which participants from different communities explored narratives of culture relating to the site. During the visits to Famagusta and Limassol, participants from Greek Cypriot, Turkish Cypriot as well as other communities of the island, participants got acquainted with the cultural heritage of those particular areas, and explored issues of Human Rights and Multiculturalism. During the visits to Lapithos/ Lapta and Paphos participants from Greek Cypriot, Turkish Cypriot communities explored the natural environment and discussed issues pertaining to environmental sustainability in the area. 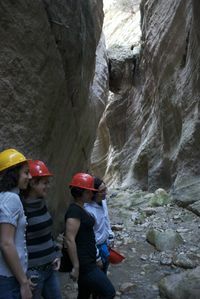 In Paphos participants had the unique opportunity to explore the environmenmtally protected area of Akamas together with experienced trainers from'Cyprus Environmental Studies Center'. A youth symposium has been implemented that brought together all participants, partners and community members to celebrate the success of the project and its Peace Bus Tour. Participants being involved at different stages of the project shared their experiences, celebrated their achievements and promised to follow-up with future initiatives.